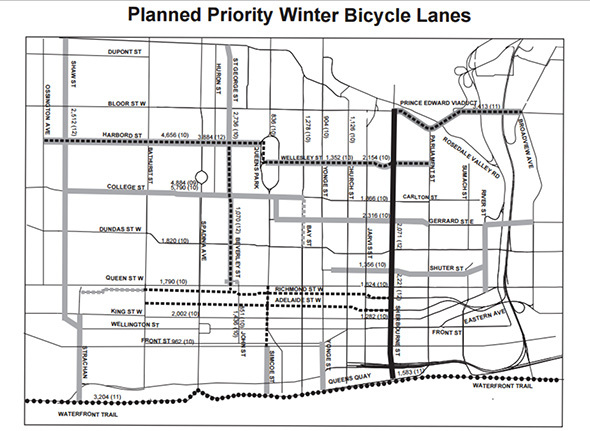 The City of Toronto will make it a whole lot easier to ride a bike this winter with the introduction of priority bike lanes that will be cleared of snow, assuming we ever get any. The network includes all dedicated cycle tracks and contraflow lanes, plus the following streets: St. George/Beverely, Harbord, College, Gerrard, River, Shuter, the Bloor Viaduct, Strachan, Lower Simcoe and Lower Yonge. Without extra maintenance, bike lanes are typically quite slippery when it snows as they don't benefit from the slow melting process brought on by vehicular traffic. As such, the city will target these routes with the goal of establishing what it calls "bare pavement" conditions. One caveat worth mentioning for would-be winter riders is that these winter bike routes will likely be havens for salt usage, which can be pretty rough on older steel bikes and pretty much all components. Do be sure to wipe your ride down regularly should you brave the elements this season.